The photo you see below has a funny story to go with it. My friend Tim made it for me in 1997. That's when Photoshop was a relatively new software program and AOL was all the rage. 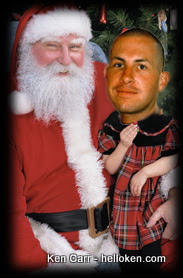 Its one of several holiday themed photos that he made for me to use as default photos on AOL. I kept the files and still use them to this day. Only now they are used on Facebook and Twitter. I e-mailed my mom the photo in 1997 when it was new. She didn't check her e-mail every day so I kind of forgot about it. Several days later, she called me. Her voice was panicked and she immediately asked if I was ok. I told her that of course I am. She asked if I was sick. Nope, I was feeling fine. She wanted to know if I was holding something back. No, I am doing great. "Why do you keep asking me these kinds of questions?" was my response. She then admitted she saw the photo I e-mailed her. I asked her if she thought it was hilarious. She said, "no, I am upset that you're so sick." I had to explain that it was a fake. I e-mailed it to make her laugh. I then had to take several minutes on the phone to explain how something like that is created and that's the magic of computers. Tim put my head on a little girl's body who was sitting on Santa's lap. My mom passed away years ago but I still get a chuckle every December when I designate the photo as my default on Facebook and Twitter. Tis' the season to be a jokester. The gift that keeps on giving every holiday season.